It's been unseasonably warm this winter and I've started a new job - all the more reason to smile in this post, which is a rarity. But before you get excited, I'm smiling because these photos were taken on the weekend when I don't have to deal with the mundane banalities of corporate culture. I used to work in a super relaxed environment. I used to go to work in sweatpants. I used to wear whatever I wanted, whenever I wanted. Gonna be honest, I spent a good week sulking over my wardrobe because the majority of what I own is now deemed inappropriate for work. Like this brand new dress from Lurap. I love the zipper details, but I should have gone with the custom option to make this dress longer because it's definitely too short for work. So unfortunately, it will be banished to weekend wear only. Worst of all is the realization that the corporate world is exactly like you see on TV, and exactly like high school. But instead of Abercrombie, people walk around in Armani. I bought a pair of oxfords to bring some androgynous menswear (and comfort) to my days, but the lack of click-clacking coming from my high heel-less feet was actually kind of unnerving. When you're supposed to dress for the job you want in a highly corporate world, where does that leave room for individuality? Oh, and wearing bold necklaces doesn't count because everyone does that. When everyone does it, suddenly no one is special. For the past few Christmases, I've used it as an opportunity to slowly transition The Boyfriend's wardrobe into something...more acceptable. 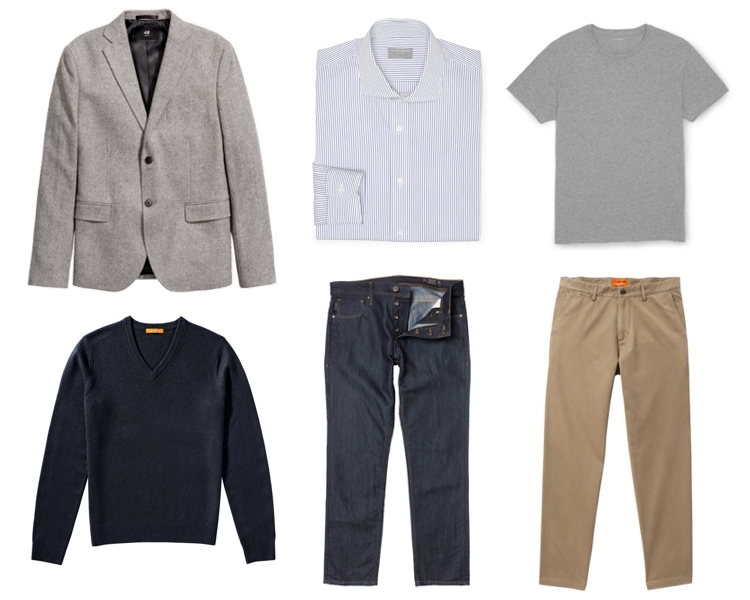 For guys who hate the thought of shopping and trying to look put together (and for girls who want to update his style), I've put together a list of staples that every guy needs in his closet. These pieces can be completely mixed and matched, which extends the range of his looks. Realistically, guys only need 3 standard pairs of pants in their wardrobe: khakis, fitted men's jeans, and dress pants. Khakis and jeans are versatile for any and every day. Face it, no one is gonna notice if you wear the same pair of pants over and over. Depending on his job, he may or may not use the dress pants on a regular basis, but every guy should own dress pants in case special occasions pop up. I suggest getting classic shirts in a few colours, but in terms of basics, guys need four key tops: a plain t-shirt, a sweater, a dress shirt, and a blazer. Bonus points if you can get a dress shirt that can be dressed up or dressed down, like a classic striped shirt. Wear these tops any day, or add instant refinement by throwing on a blazer overtop. I say that this is a menswear post, but this actually works great for girls too. Maybe if I listened to my own advice on owning minimal classics, my closet wouldn't be overflowing.